I have always wanted to learn how to make a pizza since fallen for it during my university days in England. It has had been a fast and inexpensive meal option during my 3 years of hectic school life, rushing between lectures, projects, housekeeping and socializing. The secret in making a good pizza lays with its dough and to make a good one has always been my quest that was shelved after my return to Singapore with my commitment to work and family life thereafter. Fortunately for me, this personal wish of mine has finally been checked after I received an invitation to learn from a master at MDIS during its one-day open house for School of Tourism and Hospitality! 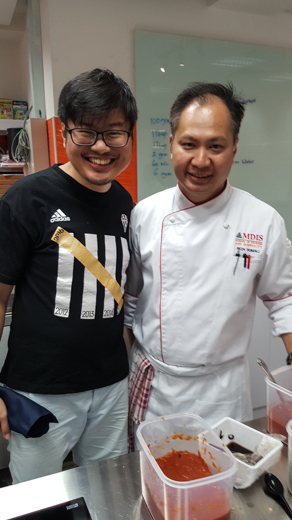 I must admit that I was rather surprised that MDIS conducts baking or cooking classes as my impression of MDIS has always been confined to a private college providing business and management related studies for mainly foreigners. 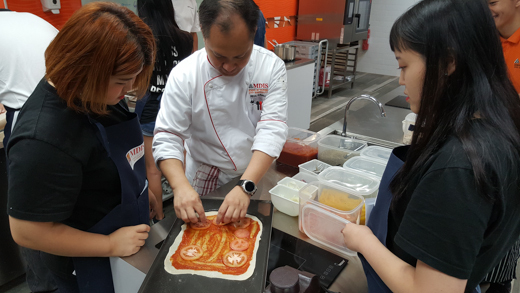 The pizza-making class that I attended was conducted at the all new culinary studio, which will also serve as the main baking facility for the MDIS bakery. 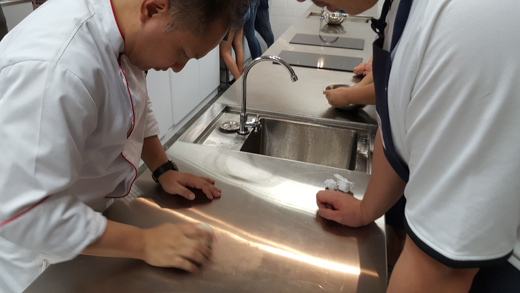 According to the good people at MDIS, the investment is aimed at nurturing talent for the future by equipping students with knowledge beyond mere concepts and practices in food and beverage. The School of Tourism and Hospitality will be offering short courses to enhance its students' culinary skills and is exploring certificates and diploma courses in culinary arts and catering management in the near future. 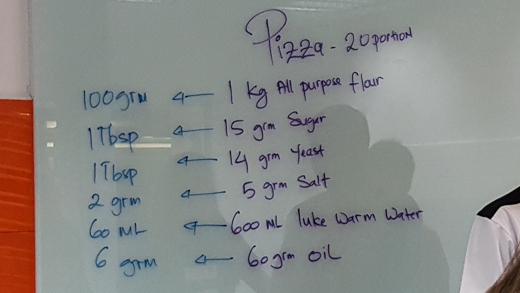 In the following, I will be sharing the secret recipe, method and tips that I have picked up during during the pizza making class that I attended. The key to making a good pizza dough lays with the type of flour used and the proportion of each ingredient added to the flour to make a bouncy dough. 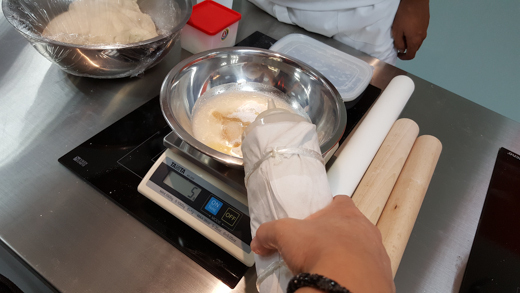 Apparently tropical room temperature like we have in Singapore is an ideal environment for dough making as it reduces the time need to rise the dough (approximate 30min). 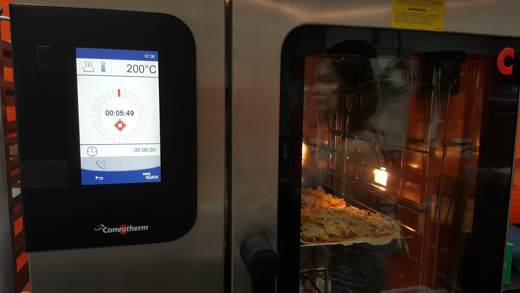 Investing in a digital weighting machine is ideal as it allows you to determine the right quantity of ingredient to be added together. 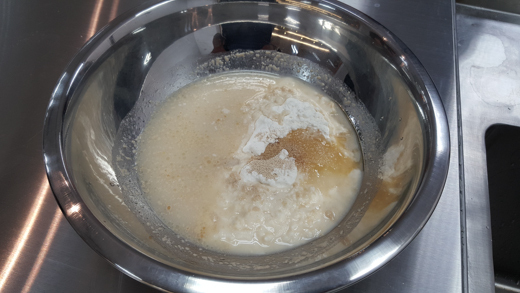 Once that's done, it is about mixing the mixture together with a fork (or a clean hand) until everything come together as one sticky form. 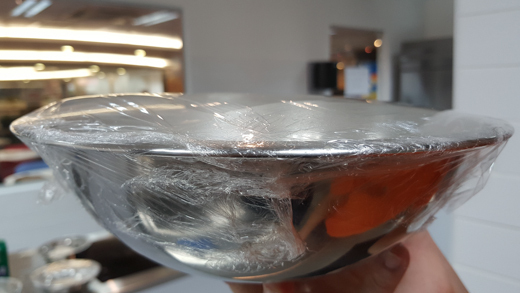 At this point, you will need to take the well mixed sticky form out of the bowl and continue to work on it with your clean hand (no escape now!) on a clean surface to knead it until it become a smooth, springy dough. The trick to making a smooth, springy dough is to bring in flour while you are kneading it. Once the smooth and springy dough takes form, place it in a bowl and wrap it and wait for it to rise. Under typical room temperate of about 29-32 degree census, it will take around 30 minutes. You will know that your dough has fully raise when it has doubled in size and is bouncy when you poke it. The next step is to start rolling it into an even flat but rectangle surface for you to place your idea topping for your pizza. 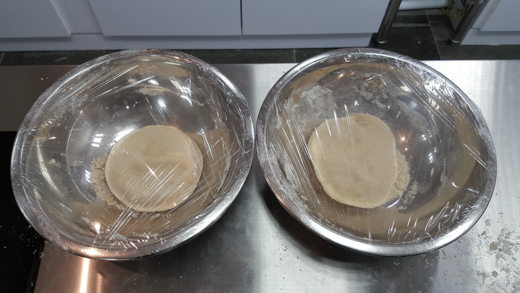 It's important to roll the dough evenly by rolling from inside out and drawing some flour along the way to prevent the dough from breaking or sticking to your roller and it will take around 10-15 minutes to complete it. Once that's done, it's fun time as it's the time for you to choose your favourite toppings and start placing them on pizza! A caution here is to avoid placing more than a layer on top of the rolled dough as the toppings (especially meat) will not be well cooked. 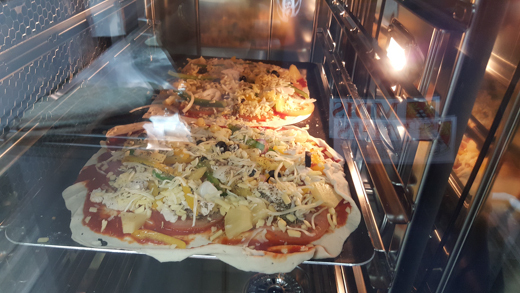 Place the end product to the oven and bake it for 6 minutes once the toppings have been placed on the rolled dough. Extending the duration or reheating the pizza will only make the crust brittle and dry. Be careful not to get yourself burnt when you take out the baked pizza from the oven. Once it's baked, it's ready to be consumed!! The yummy pizza that I made was a Hawaiian Pizza with Chicken and Pineapple toppings! 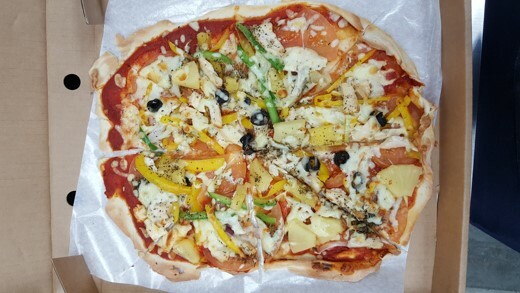 I have to thank my instructor, Mr Reza Sumali, for his patience and guidance in teaching me how to make my yummy pizza! Special thanks also goes out to MDIS for helping me to realizing one of my dreams! Founded in 1956, the Management Development Institute of Singapore (MDIS) is Singapore’s oldest not-for-profit professional institute for lifelong learning. MDIS has two main subsidiaries - Management Development Institute of Singapore Pte Ltd to oversee its Singapore academic operations, and MDIS International Pte Ltd to further its globalisation strategy. MDIS offers internationally accredited courses from globally recognised universities in France, the United Kingdom and the United States of America. The institute has been EduTrust certified since 2010 and is one of the first Private Education Institutions to be registered under the Enhanced Registration Framework. In 2015, the institute received the Enterprise 50 Award. MDIS set up the Management Development and Consultancy in 1995 to address the training needs of the workforce. The Service Quality Centre was acquired in 2014 to diversify the institute’s offerings in training solutions and secure its position as a premium regional provider of training solutions. MDIS has three international campuses - Tashkent in Uzbekistan (2008), Johor in Malaysia (2013) and Chennai in India (2015). MDIS also has representative offices in China, India, Indonesia, Sri Lanka, and Thailand, as well as agents throughout Southeast Asia.